Supreme Court Fair Housing Act ruling: It makes fighting housing discrimination easier, but it’s not enough. 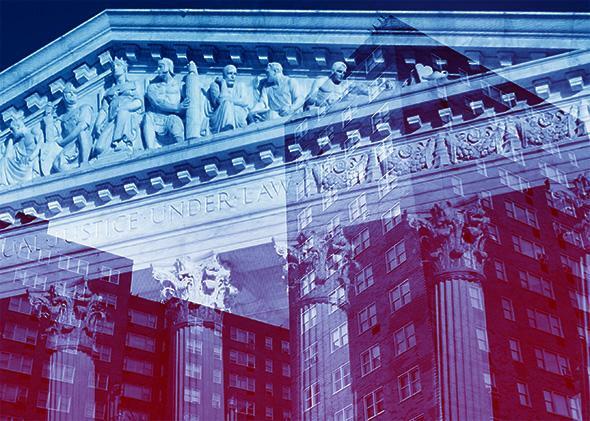 The Supreme Court just dealt a blow to housing discrimination. But we’ll need more tools than that to solve inequality. Supreme Court superimposed over the Savoy Park housing complex in Harlem. Photo illustration by Slate. Photos by Chris Hondros/Getty Images and Shutterstock. In a 5–4 decision on Thursday, the Supreme Court made it easier for advocates to use the Fair Housing Act to integrate communities and dissolve the racial and economic lines dividing them. This decision has immense historic significance, as government and private actors for decades have located affordable housing in low-income neighborhoods. This historical trend has separated the poor from the affluent, effectively cleaving cities and regions into separate areas—those largely for the wealthy and white, and those largely for low-income people of color. Ensuring that more housing gets built in high-opportunity neighborhoods can help erase some of the geographic and social boundaries between America’s most and least prosperous citizens. But we also have to deal with the important truth that mixed-income housing strategies alone won’t end housing segregation or solve poverty. In fact, historical efforts to better integrate housing have shown mixed results, suggesting that the location of your housing is only one part of the prosperity equation. The Supreme Court case, brought by a Dallas-based nonprofit called the Inclusive Communities Project, sued the state of Texas in 2009 based on how the state distributed its low-income housing federal tax credits, a mechanism that provides much of America’s funding for affordable housing production. The Inclusive Communities Project argued that Texas’ decision to allocate tax credits almost exclusively in low-income communities of color created a disparate impact that unfairly disadvantages certain people by race. Our current geography is shaped by the impacts of similar choices to build affordable housing in poor communities of color. The practice of redlining, for instance, limited the neighborhoods in which the Federal Housing Administration was willing to lend mortgage dollars during the middle of the 20th century. The communities that couldn’t get loans were disproportionately home to blacks or other people of color. As a result, whites were able take advantage of the federal housing subsidies and move to new communities in the suburbs, leaving poverty and racial minorities behind in a process known as white flight. The Supreme Court’s ruling is critical to addressing this legacy of segregation. Families who were redlined, and their descendants, should have the opportunity to move to lower poverty neighborhoods if they so choose. The mechanism of affordable housing can create a pathway for families with limited means that are looking to move to more well-off neighborhoods. We also know, however, that the impact of low-income families of color moving to neighborhoods with lower poverty and more white residents is far from conclusive, hinting that a full economic mobility strategy has to deal with more than just housing. The results of the Moving to Opportunity program of the mid-1990s show some of the promises, as well as the complications, of trying to aid low-income families and individuals by increasing their access to opportunity-rich neighborhoods. MTO found that families that moved under its voucher program were more likely than the control groups to move to lower-poverty and safer neighborhoods and that women and female children in particular showed reduced psychological distress and depression after moving. However, overall family employment, educational, and income outcomes were not significantly different from other groups, and many boys who moved did worse psychologically in their new neighborhoods, which some attribute to connection and identity with their former communities. The results seem to show that although opportunity housing can improve some aspects of a low-income family’s life, it isn’t a complete solution to poverty on its own. Factors such as access to quality jobs, affordable child care, educational opportunity, and more significant public transit investments are also vital to improving a family’s economic outcome. For example, pairing opportunity housing with a job-readiness program, an internship, and educational supports could potentially have a deeper impact. So although the Supreme Court’s decision is a critical step toward housing equality, we have to remember that the job doesn’t end. It will take a far broader policy approach to outweigh the decades of negative impacts that segregated housing has created.